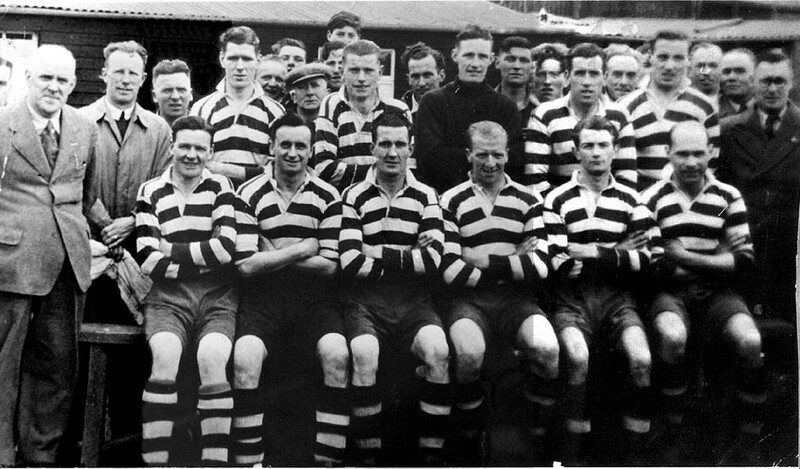 FOLLOWING a unanimous decision at the end of the 1946/47 season, the Irish League returned for the 1947/48 season, with Coleraine once again among the 12 member clubs. Much had changed at the club since before the war, with Kevin Doherty (right) a rare familiar face from the side which had played in the last league season before suspension of competition. 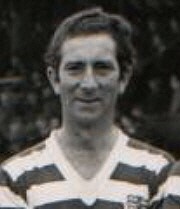 Once again, a cross-channel player/manager was employed, with Isaac McDowell, formerly of Scotland’s Cowdenbeath having been appointed in September 1946 and had led the team to fourth in the final regional league season. 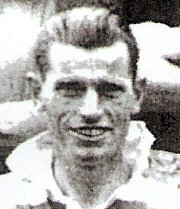 McDowell would finish the season as top goalscorer, with 18 goals in 38 appearances, followed by Terry Clarke and young winger Stanley Mahood on 14. Coleraine ultimately finished the 1947/8 season in sixth place, but it was the run to their first Irish Cup final which really captured the imagination. East Belfast and Derry City were defeated in the first two rounds before an epic semi-final against Belfast Celtic at Solitude. After the first game was drawn 3-3, goals from Clarke and Mahood (2), saw Coleraine defeat the league champions elect 3-2 and progress to their first final. But the final, against Linfield at Celtic Park, ended in disappointment. The final score was 3-0 to the Blues and a bad day for Coleraine was compounded by Mahood suffering a broken leg in an accidental collision with one of his team mates. These being the days before substitutes, Coleraine had to play on with ten men. Controversially, it later emerged that one of Linfield’s players had not been submitted in their squad list before the final and was thus ineligible to play. Technically Coleraine had every right to claim the trophy, but didn’t appeal due to the good relations between the clubs. To their credit, Linfield played Coleraine in three benefit games for Mahood, whose promising career at the club was cut short by his injury. If the club’s supporters had thought a first cup final appearance was a sign that success was just around the corner, the following season was a very rude awakening. A number of key personnel left, with Kevin Doherty heading back to England to play for Hyde United, Terry McCavana being posted to Nottingham with the R.A.F. 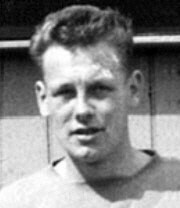 and subsequently joining Notts County, while up and coming young player Bertie Peacock was transferred to Glentoran. Just three games into the season, McDowell departed to Linfield for an Irish League record fee. He’d go on to earn his place in Linfield folklore as the manager of their seven trophy winning team of 1961/62, but for Coleraine the immediate future was somewhat less positive. At the end of the 1948/49 season, they finished bottom of the league with only nine points from 22 games and failed to make an impact in three of the cup competitions, although they did reach the Gold Cup semi-finals before losing to Linfield. The following season saw a slight upturn in fortunes, finishing 10th, ahead of the two North Belfast sides Cliftonville and Crusaders, who had replaced Belfast Celtic in the league that season following their withdrawal from football. Doherty and McCavana returned while there was a solid season from Frank Montgomery, who had joined towards the end of the previous season. Along with Terry Clarke, the top goalscorer that year was local lad Harry McCormick, (left) who had rejoined the club from Everton at the start of the campaign. 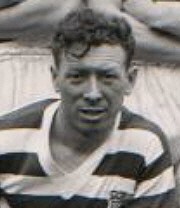 Former Hibernian player Arthur Milne was appointed player/manager for the 1950/51 season and led Coleraine to fourth place, their highest league finish in 19 years. Doherty top scored with 23 in 39 games; McCormick and Liam McConkey both grabbed 17 but, despite the improved league finish, silverware still eluded them. Once again Coleraine reached the Ulster Cup semi-finals, but lost after a replay to Linfield. Milne looked to build on his initial promise with a lot of significant transfers before his second season. In came Harry Gregg, (near right) a schoolboy international goalkeeper who was returning to Coleraine after a spell with Linfield Swifts, Clancy McDermott, (far right) an experienced former Glentoran half back, Jackie McIlreavy, a local lad who returned after several years at Ballymena and Jimmy Kelly, a winger who had played for Coleraine in their very first season before moving to Liverpool and, subsequently, Derry City. The new arrivals helped bring about another strong showing for Coleraine, who finished third in the league, with the manager scoring 31 goals in 37 appearances. Gregg left early in the following campaign to join Doncaster Rovers in England and start on the path which would lead him to Manchester United and international stardom, meaning Wesley Ard and then Jim Watt both had a chance to stake their claim. Although Coleraine fell away slightly to finish sixth in the league, they enjoyed better fortune in the cups. They missed out on a final place in the Ulster Cup by a single point, finishing second in their preliminary group to Glentoran and put together another strong Irish Cup run. 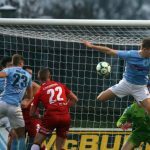 Ballymena United were defeated at the third attempt in the first round, Crusaders edged out 1-0, thanks to a goal from McCormick in the second, before a 5-0 win over Glentoran II in the semi-final. Goals from Hugh Colvan, Frank Montgomery, Tim Cuneen and Eddie O’Kane (2) booked Coleraine’s second final appearance. Waiting for them there were, once again, Linfield. Only McCavana and Doherty remained from the side which played in the 1948 showpiece, but there was to be no revenge for them as this time Linfield ran out 5-0 victors and the wait for a trophy went on. 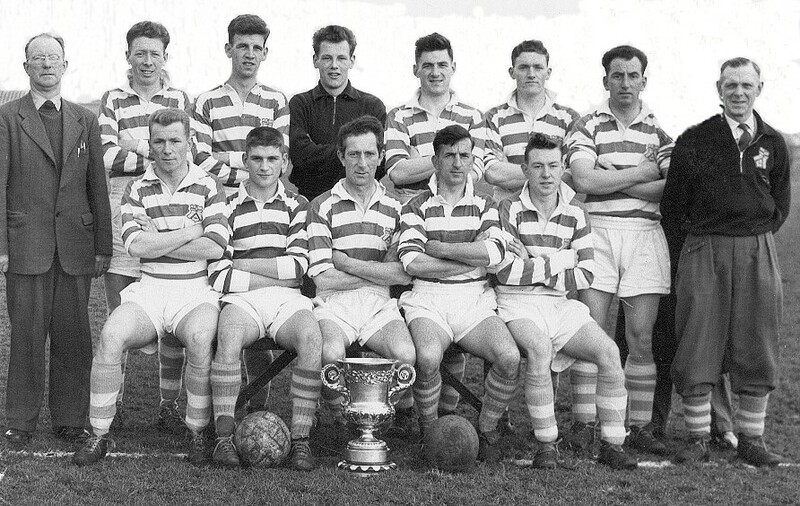 Under new player/manager Willie Buchan, Coleraine started the 1953/54 season in fine form. As usual, the season opened with two cup competitions and although the Ulster Cup brought a mixed bag of results, Coleraine saved their best for the City Cup. Played in an 11 game league format, Coleraine scored goals for fun in the early matches and by the end of October were clear leaders of the tournament. 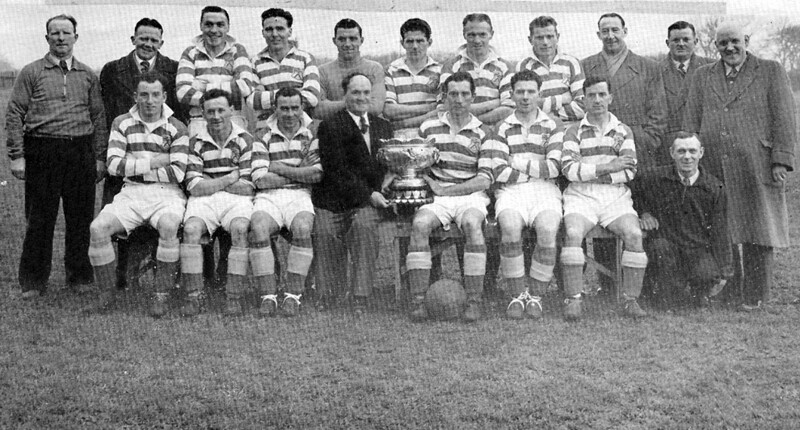 On November 14 1953, they travelled to local rivals Ballymena United, one point ahead of Glentoran and needing a win to ensure lifting the trophy. This was achieved in emphatic fashion, Tim Cuneen (2), Kevin Doherty and Eddie O’Kane getting the goals which brought the trophy to Coleraine for the first time. A week later there was a significant new arrival at The Showgrounds. Centre forward Fay Coyle, (right) who had impressed in scoring a hat-trick for Derry City against Coleraine earlier that season, was snapped up following his return from a spell working in London. He was to prove an excellent acquisition, netting 12 goals in that debut season and going on to hit 241 for the club in just 348 appearances. Another mid-table finish in the league (seventh this time) and an early exit from the Irish Cup represented late season disappointments, but slowly but surely Coleraine looked to be putting together a team capable of competing with the best the Irish League had to offer. The 1954/55 season brought another new player/manager, the Scot Peter McKennan, and a blistering start, with Coleraine topping their Ulster Cup section unbeaten, scoring 20 goals in five matches. Sadly their goalscoring prowess deserted them in the final as they went down 3-1 to Glenavon. Their defence of the City Cup also floundered and although they put together a strong run in the Gold Cup, Linfield once again proved too great an obstacle in the semi-final. 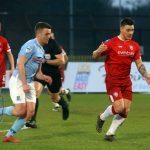 Fifth in the league and a first round knockout in the Irish Cup seemed scant reward for an exciting attacking side, although they did pick up the North West Cup after a replayed final against Derry City. Coyle scored a phenomenal 38 goals in 39 matches, but he had to share the limelight that year with Frank Montgomery and Terry McCavana, (left) who became the first Coleraine players since the 1930’s to play at full international level. 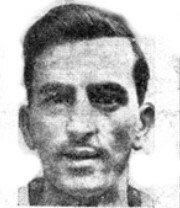 Coyle would get the reward for his outstanding goalscoring form when he was picked twice in consecutive internationals for Northern Ireland in the autumn of 1955 (playing alongside McCavana both times) and again top scored for the club, this time with a mere 34 goals in 38 appearances. But again it was a frustrating season in terms of silverware. Coleraine lost heavily in the Ulster Cup final to Linfield and, in a play-off for the City Cup, to Glentoran (after the two sides had finished the 11 game series level on points) and suffered first round knockouts in the Gold and Irish Cups. Fifth in the league and another North West Cup win over Derry City at least represented continued progress. The following season saw Kevin Doherty taking over as player/manager, but Coleraine endured a mixed start to the season in the Ulster Cup, including some inexplicably high scoring games like a 7-4 win at home to Bangor and an 8-2 defeat away to Derry. Again they finished fifth in the league and lost in the first round of the Irish Cup, but they did make it to the semi-final of the Gold Cup at the season’s end, losing 3-1 to Derry. 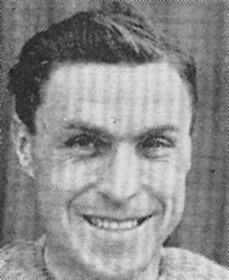 Coyle again led the way in the scoring charts; not far behind him was a new signing Hubert Barr, who marked a fine debut campaign with 24 goals. The 1957/58 season was a difficult one for Coleraine. Inconsistent early season form meant they weren’t able to make an impact in the City Cup, Ulster Cup or Gold Cup, while the loss of Fay Coyle to Nottingham Forest mid-season hurt their chances of a high league finish, ending up seventh. One positive was the form of new goalkeeper Victor Hunter, who made his first team breakthrough and established himself as first choice. The following season began with a boost for Coleraine as Coyle, who had been unable to settle in Nottingham, returned to The Showgrounds at the end of July, quickly resuming normal service and going on to hit 31 goals that season. Inconsistency meant Coleraine couldn’t put a good run together in either the Ulster Cup or City Cup, but they were able to hit form in the knockout Gold Cup, winning 3-2 in their opener at home to Distillery thanks to goals from Barr, Trainor and Coyle. Cliftonville were seen off 3-0 in the second round (Barr, Johnny Crossan and an own goal) before Derry were swept aside 3-1 in the semi-final thanks to one goal from Coyle and two from Trainor. 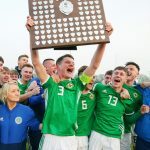 That set up a final clash against Glentoran and ten days after the semi-final the two sides met in a City Cup game at The Oval, a dress rehearsal for the Gold Cup showpiece. It could hardly have gone any worse for Coleraine, who were on the wrong end of a 7-1 hammering. This result and a 7-2 defeat at the hands of Linfield three days before the final meant that Coleraine went into the final at Windsor Park as massive underdogs. But cup finals can often throw up surprises and this Coleraine team bore little resemblance to the one which had lost at The Oval. The defence stood strong, repulsing Glentoran’s attacks and in the end, one goal proved enough to nick it. Johnny Crossan, only 19 at the time, was the man of the moment as he secured the cup for Coleraine for the second time. Not long after this, he looked to have earned a dream move to England, but would soon be embroiled in a scandal which would put his entire career in jeopardy. Coleraine eventually finished the league season in eighth place, although they were only five points off third in the final table and picked up the North West Cup again, after two goals from Trainor saw off Derry City in the final. But the following season was one to forget as Coleraine slumped to 11th in the table and, for the first time in several years, were required to seek re-election to the Irish League. One positive was the February debut of Johnny McCurdy, aged just 15, against Bangor. He played on the wing and scored, although it was as a full back which he would become best known over the years to come, going on to play more times for Coleraine than any other player. The 1959/60 campaign was also notable for the penalty-saving heroics of Victor Hunter (left). Over the course of the season Coleraine conceded 17 penalties, on four occasions giving away two in the same match. Despite these statistics, only six penalties were successfully converted as Hunter despite the team’s poor form, cemented his rising reputation as one of the league’s best goalkeepers. There were a number of promising young players on the verge of stepping up to the first team, but their day was still to come. As it was, the present was something of a struggle. 1960/61 brought more difficulties, with Kevin Doherty being hospitalised in November and team captain, Clancy McDermott, taking responsibility for the team in his absence. New signing Terry Harkin formed a good partnership with Coyle, the duo accounting for 46 goals between them but, bar the North West Cup, won once again against Derry City near the end of the season, no silverware ended up at The Showgrounds and Coleraine finished the league in tenth place, just one point away from having to apply for re-election once again. But the winds of change were gathering at The Showgrounds and the summer of 1961 would change the entire course of the club’s history.